The Cold War which lasted for more than 40 years was a struggle between two major ideologies and while there were many events and items that symbolized the struggle between the East and the West, one structure- the Berlin Wall was one of the most recognizable symbols from this time period. In fact, with the eventual tearing down of the Berlin Wall, the Cold War in effect ended. 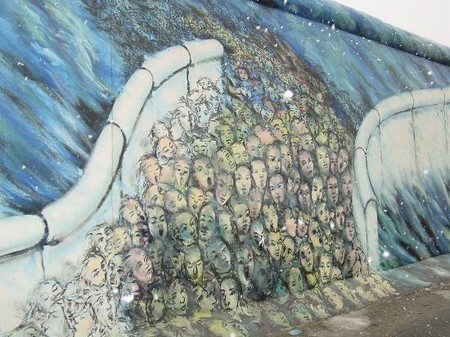 Here is the history of the Berlin Wall. At the end of World War II, Nazi Germany was carved up into four specific occupation zones as part of the Potsdam Agreement. The four occupational zones would from this point on be controlled by the Allied powers which included the French, British, Americans and the Russians. In addition, to dividing up the remains of Nazi Germany into four occupational zone, the city of Berlin, which would be the governing seat would also be divided into 4 zones, again controlled by the 4 Allied members. However in 1949, as the Cold War began, instead of jointly governing the region as originally proposed, the Soviet Union created a new state from their occupational zone called the GDR (German Democratic Republic which included East Berlin and the Americans, British and French consolidated their regions into one state now called the Federal Republic of Germany which included West Berlin. The two countries set up by the Allied powers the GDR and West Germany began to diverge almost immediately as the two countries were based on different ideologies and market principles. West Germany was based upon the West’s free market system and democratic government. The GDR was based on the Soviet Style planned economy and communist ideology. Within a few short years after each country was created, there were recognizable differences in quality of life and life style. In fact, during the early 1950’s as West Germany and West Berlin became quite prosperous and as the GDR and East Berlin lagged behind many in East Germany and East Berlin began to emigrate. Not everyone left for purely economic reasons. In fact, many of those living in the Eastern Bloc countries went through borders at East and West Berlin in order to flee the Sovietization and Joseph Stalin. It should be noted that in the early 1950’s there was no natural border between East and West Berlin and traffic moved quite freely between the city, many in the Eastern Bloc took advantage of this crossing point. In fact, many East Berliners moved back and forth between the border during this time. However, as time went by, the exodus to the West was apparent and it caused the GDR and the Soviet Union to take action. During 1950, 51, 52 and 53 close to a million citizens left the GDR for the West. This was a huge percent of the population and to make matters worse, it was causing a huge brain drain since the most likely people to leave were those that were highly educated or skilled. In the very early 1950’s the East/West Berlin border could be easily crossed, however as the Soviet Union started to crack down on emigration, so too did the Eastern Bloc countries including the GDR. On April 1, 1952 a meeting took place between leaders of East Germany and Stalin. Stalin’s foreign minister introduced a system of passes for visits to West Berlin, in addition, Stalin told the East Germans to quickly build up the border and to create a demarcation line between East & West Germany. However, Stalin went one step further, he communicated to the East Germans that he wanted a very dangerous border, one where the East Germans will guard the border with their lives. With this meeting, the border between East & West Germany was closed and even a barbed wire fence was erected. However, while the inner border of East & West Germany was constructed, the border in Berlin remained opened. With the rise of restrictions, many East Germans and Eastern Bloc citizens started to fear further tightening and started to emigrate en masse. In 1956, as emigration continued on a large scale- usually under the disguise of family visits, the East German in effect eliminated all travel to the West. Even with all travel for East Germans effectively eliminated, since the border at Berlin was administered by the four occupying powers, it was still possible for many East Germans and Eastern Bloc citizens to find ways through Berlin to the West. In fact, by the end of the 1950’s almost 90% of all emigrants came through the border at Berlin. It should be noted that there were penalties for getting caught for crossing the border illegally- usually heavy fines, but since there was no natural border and there were even subway train access to East Berlin, many found Berlin to be the most practical way to cross into West Germany. For more than a decade, the emigration problem was doing plenty of damage to not only East Germany, but the Eastern Bloc countries due to the brain drain of highly educated and skilled people leaving for the West. However, in 1961 the border issue came to a head and on August 12, 1961, Walter Ulbricht which was the First Secretary of the Socialist Part and the GDR State Council Chairman signed the order to close the border and build a wall to separate East & West Berlin. The wall began construction at midnight on Sunday August 13, 1961 as the police and the East German Army closed the border. They then went ahead and started to tear up streets that were along side the border to ensure that vehicle traffic could not pass. The first actions of constructing a wall was the installation of barbed wire and fences which bordered the entire length of the three western sections (97 miles) and separated the city of Berlin into two (27 miles). The Berlin Wall was built on the inside of East Berlin and East Germany to ensure that none of the Allied borders were infringed on. On August 15, concrete slabs of the Berlin Wall started to be laid. It should be noted that besides concrete, chain fences, minefields and other obstacles were also installed along the inner border to stop defectors. The Western countries including the Allied forces of the US, UK and France were obviously enraged, however, the reality of the situation left little recourse. A war with the Soviet Union and Eastern Bloc countries was out of the question as it was believed it would include nuclear weapons and while diplomatic channels were being used, it was realized early on that the removal of the Berlin Wall would not happen in the short term. It should be noted that while the Berlin Wall was constructed there were still border crossings due to the fact that the Potsdam agreement created an Allied zone. In total, there were 8 border crossings between East and West Berlin. While GDR citizens were not allowed to leave their country, as well as other socialist countries (unless they had the proper permits), West Germans and Allied personnel could cross into East Germany. One of the most well known border crossings was called Checkpoint Charlie. It was mainly used by Allied personnel and foreigners. 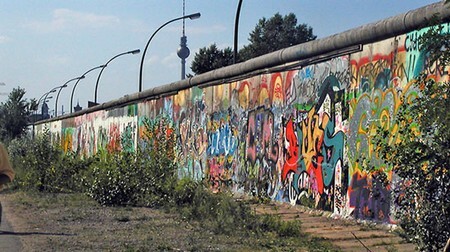 In the early years of the Berlin Wall being constructed, generally speaking West Germans and foreigners could not enter into East Berlin, however as the years progressed, Western citizens could apply for a visa to visit East Germany, but the government could still refuse entry. With the construction of the Berlin Wall, many citizens of East Germany tried to defect by climbing over the wall. In fact, about 5,000 people successfully escaped to West Berlin during the time the wall was erected, however many people also died trying to cross the wall. It is estimated that over 200 people were killed trying to escape over the wall. While official orders form the GDR did not necessarily state to kill a person trying to defect, it did authorize force including being shot at. It fact, the strip around the wall was named the death strip, because if an escapee was wounded, the West could not save the defector, no matter how close they were to the wall (as the West did not want to provoke an international incident). Many times, defectors shot or injured near the wall would simply bleed to death. The last person to be shot trying to defect was in February 1989, less than a year prior to the dismantling of the wall. Being one of the many symbols of communism, it is no surprise that with the decline and eventual end of the Soviet Union and communism also came the destruction of the Berlin Wall. The beginning of the end of the Berlin Wall came in late August of 1989 when Hungary, a country part of the Eastern Bloc removed defenses to its border with Austria. This helped thousands of Hungarians, as well as other Eastern Bloc countries to defect through Hungary into Austria. As many East Germans started to travel to Hungary in order to defect, the East German government halted travel for East Germans to Hungary. Shortly after Hungary removed its defenses with Austria’s borders, Czechoslovakia did the same. This time the GDR allowed East Germans to defect through Czechoslovakia. In addition to the removal of defenses, in 1989 with the Soviet Union releasing its grip on the Eastern Bloc, many mass demonstrations took place including within East Germany. On October 18, 1989 the leader of East Germany, Enrich Honecker resigned. Egon Krenz took his place. As the demonstrations grew and grew- approaching over a million people in Alexanderplatz in November and as defectors continued to leave in droves through Czechoslovakia, the government was under pressure to allow emigration through its own borders. In order to ease this pressure, on November 9, 1989 Krenz decided to allow emigration directly through crossing the East German border into the West. While the decision was made on November 9, the new border crossing regulations were to be implemented on November 10 in order to give the border guards enough time to prepare. However, Gunter Schabowski, the Party Secretary for Propaganda was to give the announcement. And while Schabowski was on vacation at the time, he was giving a press conference and was handed the new orders. Since the new order did not have the date of November 10, Schabowski thought the new orders were to be implemented immediately. At the press conference he announced the implementation of the new orders and with further questioning from reporters he made the statement that the new regulations would be implemented immediately and that the border crossings would include those of Berlin. As thousands had either watched or heard the news conference, immediately afterwards, tens of thousands of East Berliners rushed to the checkpoints at the Berlin Wall and demanded to leave. As the border guards were overwhelmed and no government authorities would issued commands to use force, there was effect no way to hold back the thousands of citizens seeking entry to West Berlin. The border guards finally gave way and allowed East Berliners to leave. East Berliners were met on the other side by ecstatic West Germans and huge celebrations were underway. 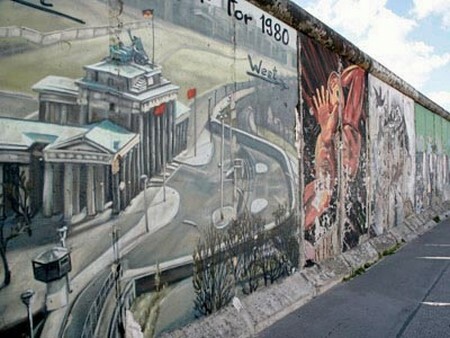 From November 9 on, the Berlin Wall was quickly chipped away, using sledge hammers, construction tools, etc. Many people kept pieces or sold these pieces as souvenirs. The official dismantling of the Berlin Wall began on June 13, 1990 and as of July 1, 1990 the GDR instituted the West German currency and all border controls officially ceased. The last of the Berlin Wall was removed in November of 1991- however several pieces of the wall still stand as a memorial. With the dismantling of the Berlin Wall, so to did the government of the GDR dismantle. Both the GDR and West Germany agreed to reunify. Reunification officially took place on October 3, 1990.